. Closed Tags: Cadogan Enright. 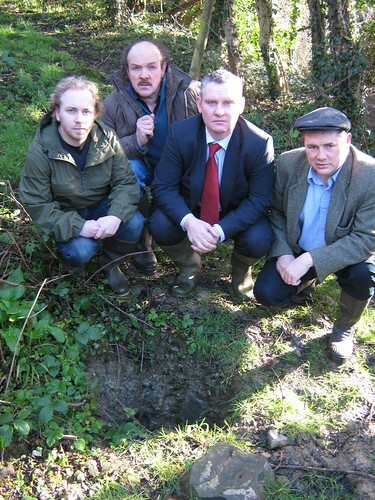 Photograph shows (from left) Steven Agnew Green Party EU candidate, Noel Killen Lecale Conservation, John McAllister Ulster Unionist MLA and Cllr Cadogan Enright Green Party Downpatrick at the site of the Badger Baiting. DOWN District Councillor Cadogan Enright has condemned a small group of local people who are working with criminals based in Belfast who are involved in badger baiting in the Down District area. Cllr Enright said that “I have reported those who I feel are responsible to the PSNI, and I hope that investigations will follow”. Cllr Enright is on the local policing partnership. Cllr Cadogan Enright was joined in his condemnation by the Green Party EU Election candidate Steven Agnew. 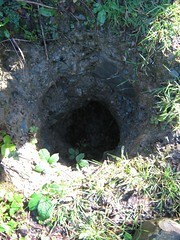 Mr Agnew continued, “Fortunately in this case the badger set seems to be remained intact as it appears the culprits were disturbed. I know that the community is appalled by badger baiting and it is important that we all support the police and the USPCA to put an end to this unwelcome activity”.